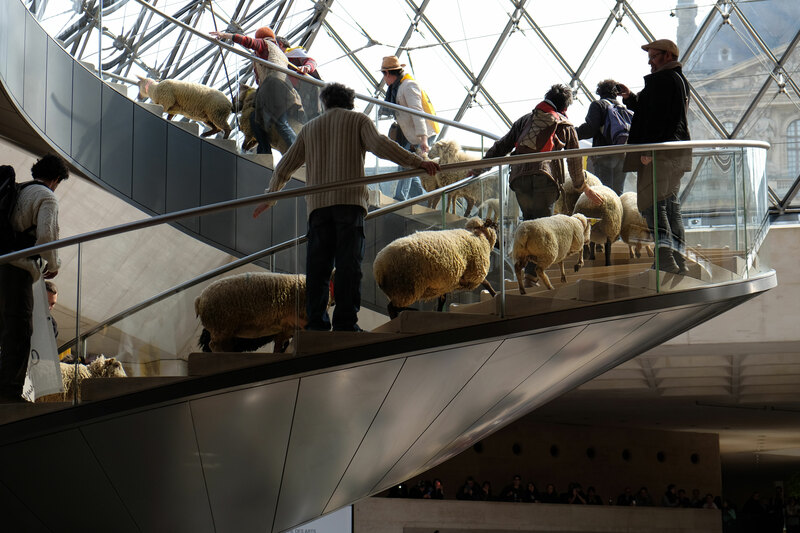 What the Flock was going on at the Louvre? The Louvre or the Louvre Museum is one of the world’s largest museums and a historic monument. A central landmark of Paris France millions of tourists flock there every year. They aren’t the only ones that “flock” there. In March of 2014, while I was “flocking” to the Louvre Museum myself I stopped that the nearby Starbucks to have a good cup of Coffee and write a few post cards. While I was enjoying my coffee there was suddenly a huge ruckus. Apparently there was a group of protestors representing the Confederation Paysanne: Union for peasant agriculture and the defense of its workers. Humans weren’t the only one’s protesting… so were there sheep. 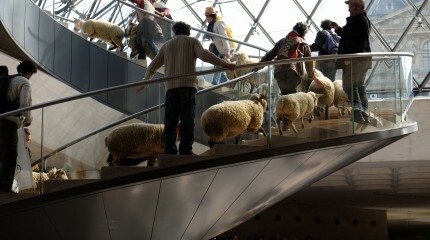 The protesters, bare and wooly were blocking the museum entrance; officials escorted them the Flock out of there and up the spiral staircase. Once outside they continued their protest.